OK, don’t be scared. I know, I know. You hear risotto and you think of risottos that take a lot of time and effort (like the Acorn Squash one I made a few months back), and you just instinctively shake your head no. But wait! There is an easier way, I PROMISE. No dice. Or, more specifically, no (cheesy) rice. Drat. Off to the cookbooks I went, to see if there were any options involving white or brown rice, and none of them quickly pointed to something I liked. BUT, one suggested a risotto, and the pantry did have a large bag of arborio rice. Score! What I ended up doing was basically preparing a risotto in what I consider to be a less time-consuming fashion. 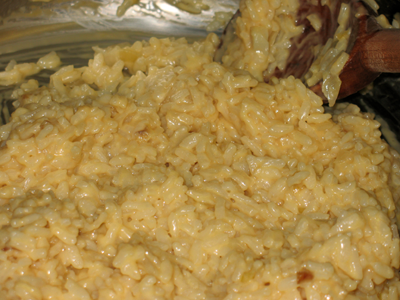 Yes, there’s still effort involved, but it’s miniscule by comparison to some AND it gets you a cheesy rice AND it’s got a limited set of ingredients AND it’s far better for you than the boxed option because it’s not a complete salt lick. 1. Peel and mince the onion/shallot. 2. In a large, deep skillet, heat the olive oil over medium heat. 3. Add the onion (or shallot), tossing it in the olive oil to coat. Cook for 2 minutes, stirring occasionally. 4. Add the broth and white wine to the pan. Stir well to combine. Cover and cook for 4-6 mins, until the mixture begins to boil. 5. Add the arborio rice to the pan and stir well to combine. Cover and reduce heat to low for 10 minutes, stirring at the 5 min and 10 min marks. 6. Raise the heat to medium-low and cook for another 10 minutes, again stirring at the 5 min and 10 min marks. 7. When the majority of the liquid is gone, reduce heat to low, then add both cheese and stir well to combine. Once the cheese has melted, turn off the heat and serve immediately. This entry was posted in side dishes and tagged cheese, cooking, rice, side dishes, vegetarian by crunchymetromom. Bookmark the permalink.